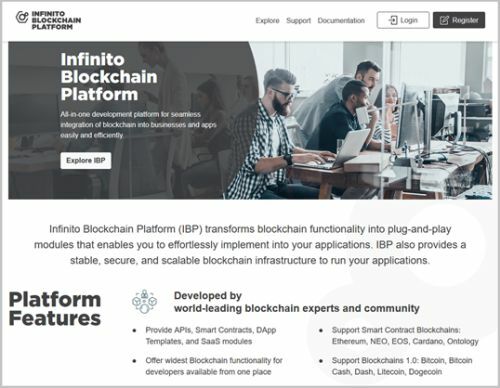 Leading blockchain tech provider Infinito, who builds and operates the Infinito Wallet, has just released a comprehensive blockchain platform for businesses and developers to seamlessly use of a wide variety of blockchain-based functionality from one stop. The Infinito Blockchain Platform (IBP for short) enables easy development of decentralized apps using APIs. Businesses can also choose from various turnkey SaaS and solutions according to their needs. IBP aims to be the number one solution for anyone looking to integrate or build practical blockchain applications. 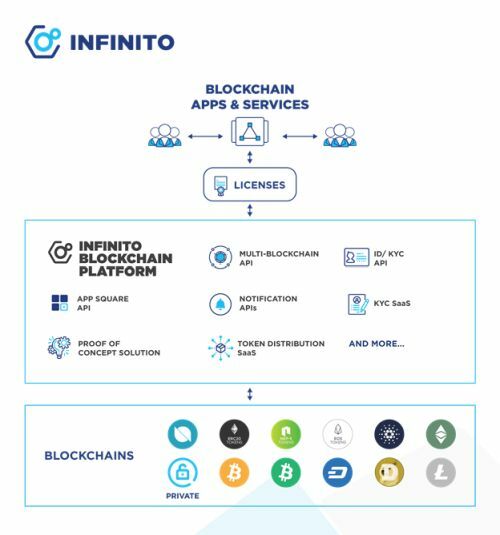 As the market for practical blockchain applications is booming like never before, the newly released Infinito Blockchain Platform promises to radically simplify development of decentralized applications and blockchain services. The platform serves to help both traditional and blockchain businesses break through the dreaded proof-of-concept stage, begin production, and later monetize their innovations. IBP will eventually evolve into a comprehensive marketplace where module creators can sell and profit from own-built innovations. With Infinito Blockchain Platform, most custom code work is eliminated thanks to turnkey, highly scalable solutions and powerful blockchain APIs that work in plug-and-play fashion. Clients can access and choose from a wide variety of blockchain development tools, including but not limited to transaction settlement, data retrieval and analysis, identity verification, multi-chain interaction, and so forth. Aside from Commercial licenses for business purposes, Infinito Blockchain Platform also offers R&D and Educational free-of-charge with set performance parameters. For this first release of Infinito Blockchain Platform, businesses can start using Infinito blockchain API/SDKs plus make use of Proof of Concept (PoC) and various solutions including Know Your Customer (ID/KYC), Wallet, Traceability, Random Number Generator, Token and Coin Listing, Token Distribution Platforms, as well as many Software-as-a-Service (SaaS) offers. PoC Solution is built on-demand and deployed on privately permissioned blockchains of choice so that businesses can effectively evaluate the feasibility of business objectives through blockchain adoption. ID/KYC features enable efficient user onboarding by harnessing the transparency and immutability of blockchain technology. Furthermore, Infinito SaaS are turnkey business operation platforms available for immediate deployment. In summary, blockchain features and tools can be easily integrated into any type of business infrastructure or any brand new venture with utmost efficiency and security. On the API side, IBP has begun to offer Multi-Blockchain API to enable decentralized application development on various blockchain networks supported by Infinito’s tech infrastructure. It also enables seamless network transactions in the form of associated cryptocurrencies. Another valuable API is Notification, separated into WebHook and WebSocket APIs, which enable developers to register multiple blockchain addresses so they can receive real-time notification of ledger data updates. Afterwards, DApps can be published on App Square, a unique marketplace built inside a community-favourite cryptocurrency wallet where services meet massive user community. App Square integration is available via App Square API. “Blockchain has the disruptive power to transform the many fabrics of society and businesses today are all setting sights on the decentralization train. However, developing with blockchain is anything but simple, especially when the technology is evolving at breakneck speed. There are numerous complex concepts and technicalities to master. By launching Infinito Blockchain Platform, we hope to provide those looking to get started with blockchain development a comprehensive platform with turnkey solutions, so that they can easily pick the technology up and spread social adoption,” says Junya Yamamoto, CEO of Infinito. All purchased modules come with samples and manuals, while the whole API Documentation is available to read for free. These detailed guides can be of great value to blockchain developers and blockchain learners, allowing them to develop efficiently or simply learn about blockchain development hands-on. Infinito Blockchain Platform will be evolving with many more different types of APIs, modules, services, and solutions periodically according the company’s roadmap, some of which includes but not limited to DApp and smart contract templates. Several of the upcoming modules to be added are currently previewable on the website. Additionally, the company aims for this platform to eventually become a full-fledged marketplace where registered blockchain partners sell their own-built modules, APIs, and services with custom pricing plus access policies. Independent developers and anyone interested apply to become a partner of IBP. Through this platform, module creators can bring their technology to leading enterprises looking to adopt blockchain. Infinito invites blockchain developers and technology companies around the world to come aboard the Infinito Blockchain Platform and create a value-driven blockchain ecosystem through which anyone utilizing, or looking to utilize blockchain can succeed.